First of all, women not speaking in the church has nothing to do with cultures. It comes from the beginning of time since the reasons for these commands were that Adam was created first and the woman was deceived. The Bible is clear concerning who shall teach men and be in authority over them in 1 Corinthians 14:34, 35 and 1 Timothy 2:11-14. The Holy Spirit would never act contrary to the principles in God’s Word nor override them. When Paul wrote about Jew, Greek, slave, male, and female, he was referring to the fact that ALL who believe on the Lord Jesus Christ shall be saved. Now, I’ve not attended any theological seminaries nor do I have a doctorate like Richter does but her assessments are wrong. Deborah was not teaching men the Word of God in a church since the Church wasn’t established yet. She was a woman in the Old Testament during a time when Israel was rebellious to the ways of the Lord. She’s not a prescription for the women in the Church age. Deborah was a description of a judge thousands of years ago. Huldah was a prophetess in the Old Testament. She didn’t teach doctrine to men nor was she in authority over them. She gave King Josiah a special word from the Lord. We are never told in the New Testament to try to become a Deborah nor a Huldah. Junia was a man according to my Bible. “Salute Andronicus and Junia, my kinsmen, and my fellow-prisoners, who are of note among the apostles, who also were in Christ before me” (Romans 16:7). I believe the word “kinsmen” means that Junia was indeed a man. Even if he was a woman, as Richter claims, he was “of note among the apostles” NOT an apostle. God didn’t choose any female apostles. The Bible does not say that Priscilla was a preacher. This is such an unbelievable stretch of the Word of God. There’s nowhere that she is recorded as preaching a sermon, teaching men (except one man that was mentioned when she was with her husband who most likely did the teaching), nor being in authority over men. She was married to Aquila and their names are often mentioned together. They helped the Apostle Paul in his ministry. The women in 1 Corinthians 11 are not instructed to preach or teach men nor be in authority over them. They aren’t to prophesy in the church since this is forbidden and just a few chapters after this, Paul wrote: “Let your women keep silence in the churches: for it is not permitted unto them to speak; but they are commanded to be under obedience, as also saith the law. And if they will learn any thing, let them ask their husbands at home: for it is a shame for women to speak in the church” (1 Corinthians 14:34, 35). He would not have contradicted himself in such a way as Richter claims. My husband, Ken, responded personally to Richter this way: I wish you would take Piper on in an in-depth discussion of this topic instead of appealing to a weak string of examples of women in ministry to overturn the clear precepts against women teaching in the church, as is clearly given in Scriptures. “I do not permit a woman to teach or to exercise authority over a man; rather, she is to remain quiet” (1 Timothy 2:12); and that an elder is to be “the husband of one wife,” etc. The actual mandates are many, yet you want to destroy them with a few crumbs of examples? Is it possible that God wants Christian women in teaching ministry in the church? If so, you will not find this from anything written in the Word, but to the contrary, it is found in a new feminist culture. It is not Piper whose interpretation is lost in culture, but you are. You and others have proposed a dangerous hypothesis that goes contrary to all of Church teaching and history until now, and goes against what the Word actually says. You postulate that because God can do anything He chooses He will go against His own Word on the matter. That the apostles’ instructions to the church were only cultural; a relic of the early NT times that God somehow thought best to keep in place in His church until now. And where is your basis for knowledge and truth? A simple presupposition, an argument from silence, with zero proof, which goes against what God’s Word actually says. What a coincidence that it comes just as feminism takes its roots in our culture. Is the Church to influence culture or is culture to influence the Church? I believe that question was settled long ago by Jesus himself when He said, “If you were of the world, the world would love you as its own; but because you are not of the world, but I chose you out of the world, therefore the world hates you” (John 15:19). Hmm… given the accolades it seems the world is loving this now. For I testify unto every man that heareth the words of the prophecy of this book, If any man shall add unto these things, God shall add unto him the plagues that are written in this book: And if any man shall take away from the words of the book of this prophecy, God shall take away his part out of the book of life, and out of the holy city, and fromthe things which are written in this book. My dad sent me this article about a female politician overseas…a good woman with good values. Even though she should not be seeking power, I do wish her well. But the thing is…she only has 2 children and is still young enough to have more. And I think…you have enough years left to have 2 more children or even 3! That would do far more benefit to your people than running for office. I think women are just missing the plot. The real way to help the world is through children. Anyways, as far as this woman you are talking about, I smell someone who has had a very fun life. Harvard, excavations, probably a lot of travel…I think her personal life looks very fun. You’re not going to get through to her, nor does she care. She’s a researcher, a person who thinks the bible ‘Is such a fascinating story!! !’ it’s not a deep thing with her. I think now the left has gotten such a strangle hold that many organizations are letting these worms in in hopes to stay in business…but in reality once you let the worm in it’s over. It’s a sad day we live in, Kathy, when women can so easily get their way and do things that are contrary to the Word of God. GOD bless you mrs.Lori it is really sad that so many men and women deny the word of GOD. It is very sad indeed. But praise YESHUA that there are bible believing christian women who truly love the LORD. This world needs bible believing women and mothers so bad right now its not even funny. May I ask when God contacted you and gave you permission to teach the word of the Bible Lori? It must be a fascinating story and I bet Sandra is so jealous. There are zero verses that support Sandra in what she is doing. I’m very sorry your alma-mater has chosen a woman in this role. I know it must be even more upsetting because of your connection to and fondness of the school. I hope Sandra Richter reads your blog post as I appreciate how you set each of her misexamples in the correct context. Her argument even starts off on a false note because it is Jesus who is the head of the church not the Holy Spirit. The Holy Spirit agrees with Jesus and teaches us His ways in accordance with His word. The Holy Spirit doesn’t change with the culture of the day. She is playing fast and loose with scripture which for one who professes to know and presumes to teach others is careless. Women can use their gifts of teaching much in the manner you are doing by teaching other women what women are called to teach. We should also use our gift to teach our children at home about God. Those two situations are extremely important but downplayed by women such as her who do not regard it as enough. Thank you so much for your teaching Lori. My husband and I always had an amicable marriage but because of your clear teaching it has become so much more through the years. I have a strong personality but just the other day I received a compliment from another woman that I was so pleased to hear. She said I was a good example in my happy submission to my husband. I do have to admit I have a fantastic husband who is extremely intelligent and loves the Lord so it isn’t hard to do but it was nice to hear anyway. I’m sure if it weren’t for your teaching I wouldn’t have received that compliment. That’s wonderful to hear, M! It’s great when others can clearly notice something that is so lacking in most marriages today. I love the role Lord has given me and I wouldn’t want it any other way. They will reap the fruit they are sowing by going against the clear teachings of the Word. Lori, How do you feel about bible studies by Beth Moore? I have done several but I keep hearing her name come up in these very types of conversations? I much prefer to have Bible studies that were written by men, Dawn, since God gave men the ministry of teaching the Word of God. From what I have observed, most of the female Bible teachers/preachers have no problems teaching men, misinterpreting Scripture when it comes to male/female roles, never mention women being keepers at home and rarely mention women living in submission to their husbands, and often “hear” personal revelations from God which is a dangerous practice. The reasons given for women not teaching men are the same reasons that should apply to women teaching women; God made man first, thus he is the one in authority, and the woman was deceived which we can see easily happening as “Christian” women drink the feminist Kool-Aid. God made it very clear in His Word what the older women should be teaching young women. This isn’t a guessing game. I don’t believe that single men are disqualified from being elders or else the Apostle Paul would not be qualified to be an elder. I believe the saying “the husband of one woman” means that he’s faithful to his wife and it helps to qualify that elders must be men. It’s so disheartening to hear how many churches are allowing females on their staffs and in teaching positions over men. They care more about conforming to society instead of conforming to the Word of God. Our speaker yesterday was talking about unity in the church. He said when we all do our part, it becomes like a beautiful piece of harmonized music. I beg to disagree, in Titus 1 v 6 it says (KJV) ‘If any be blameless, the huband of one wife, having faithful children not accused of riot or unruly’. How can a youth pastor guide and assist parents on how to raise Godly children and teenagers, when he has none of his own and no experience? According to this verse, it is a requirement that he has faithful children who are not guilty of riot or unruly. He is not biblically qualified to hold that position. I cannot comment on single men. But this youth pastor was married. “Does Paul mean that elders and deacons must be husbands, or that if they are husbands, they must only have one wife? Despite the problematic English translations, the Greek is clear: the elder must be a “one-woman man.” He must be biblically married to only one woman, and he must be faithful to her. His sexual purity must be above reproach. He cannot lead the congregation in following God if he has problems with fidelity. I never said i disagreed with single men being in leadership. I did say, however that because the young man in question was married, part of the requirement was that he had raised up Godly children. However, i would be fine with him being in leadership if medically he and his wife were unable to bear children ( not including forms of birth control. Like vasectomy or tubal ligation) or if for some unknown reason they greatly desired children, but for some unknown reason they were unable to have any. But it clearly states that men in that position if they are married, are to show that they have raised up Godly seed. This youth pastor, although married, had no children. He did have one wife, but if he and his wife were able to bear children and chose not to, then he is not qualified. I cant comment on single men however. As for Paul not being qualified as a single man to be an elder, we always thought of him as an apostle. The apostles were specially called by God himself. They had a different role than the pastors/elders/bishops/shepherds do. As for a one-woman man, I don’t think a single man is a one-woman man since they don’t have a woman at all. In my understanding it is teaching about not being polygamous. All throughout scripture God’s people are called to be faithful to their spouses so the calling of an elder would be no different. Honestly I think that the modern practice of having young inexperienced men over the congregation is not what was intended but people have gotten quite used to it. I think also the roles of preacher and pastor have been conflated so much that many do not realize those can be separate rolls. A preacher does not have to “be the husband of one wife with believing children”. But for those who run the church (elders/pastors/shepherds/bishops) they have to have the proven spiritual maturity that is called for in scripture. So single men who have devoted their lives to the ministry of Jesus Christ as the Apostle Paul encouraged can’t be elders, preachers, or pastors? I just can’t agree with this. From Ellicot’s Commentary (an old one): St. Paul, fully conscious of this low and debased moral tone which then pervaded all society in the empire, in these few words condemned all illicit relations between the sexes, and directed that in choosing persons to fill holy offices in the congregations of Christians, those should be selected who had married and remained faithful to the wife of their choice, whose life and practice would thus serve as an example to the flock, and to whose homes men might point as the pattern which Jesus loved, while the heathen world around them would see that the hated and despised Christians not only loved and honoured, but lived that pure home life their own great moralists pressed so earnestly upon them, but in vain. This direction, which requires that those to be selected to fill holy offices should be known for their purity in their family relations, of course does not exclude–should any such offer themselves–those men who, while contracting no marriage ties, still were known to lead upright, moral lives. From Gill’s Exposition: The husband of one wife; which is not to be understood in a mystical and allegorical sense of his being the pastor of one church, since the apostle afterwards speaks of his house and children, that are to be ruled and kept in good order by him, in distinction from the church of God; but in a literal sense of his conjugal estate; though this rule does not make it necessary that he should have a wife; or that he should not marry, or not have married a second wife, after the death of the first; only if he marries or is married, that he should have but one wife at a time; so that this rule excludes all such persons from being elders, or pastors, or overseers of churches, that were “polygamists”; who had more wives than one at a time, or had divorced their wives, and not for adultery, and had married others. Show me one commentary that agrees with you. Single men can indeed be preachers. Preachers are not the same as pastors. We don’t rely heavily on commentaries (I don’t own any and would need to go to our church library to find some), but I can assure you that I am not making this up, many righteous men in my fellowship understand scripture to say that an elder/pastor MUST be married and have children under control (my own father is an elder and before he was considered he had to fulfill these scriptures concerning eldership). If you really are interested in hearing of a commentary that agrees with what I believe the scriptures to say in 1 Tim. 3 I would be pleased to e-mail you Wednesday night. This has always been the practice in our fellowship. This article discusses Paul’s role (and other faithful single men). There are many many articles that talk about the qualifications of elders in our fellowship. Not a lot of articles debate the point about an elder having children because most in our fellowship have never read the scripture to say anything other so you’ll see most articles presupposing that conclusion. I look forward to siting some commentaries for you if you are still interested. Thanks for your interest in my understanding of these scriptures. I really do appreciate you and all you do and just because we see this differently doesn’t mean we always will or that I am any less grateful for your tireless work amongst us women. ContentWife, yes! They are not to be novices or else as you quoted they can be puffed up. All throughout scripture the aged are called upon to lead the younger (not vice-versa). That is one reason I am so very grateful to Lori’s blog because not many women do this. 🙁 It has been floated around by some that my husband should consider being an elder. We still have young children and in my opinion in his early 40s I think he is still too young. He is a Godly man and not at all a novice as he preached his first sermon at aged 14, fills in for preachers near and far and teaches the adult Bible classes frequently. But that is not the same as running a church and dealing with all the difficult issues that come up. My father became an elder in his 60s and I always think that is a blessing to have men of his age leading the flock. (Not saying the Bible gives an age, just my opinion). I personally believe that it’s the oversight’s responsibility to make that decision on whom to appoint to the eldership, whether married or unmarried. If you have ungodly leaders in place, they won’t abide with what Scripture says anyway, and things can go from bad to worse in a local meeting. Here’s my practical experience with this subject. When I was young, the elders in our assembly were all married with children except for one. He was a godly man but not married. He served the Lord faithfully as an itinerate speaker traveling to various assemblies and also devoted his summers to our Christian camp. But… There was the issue of his not being married as an elder, and some had a problem with that fact. He stood firmly on God’s truth and wasn’t afraid to back up God’s Word with action. That being said, he did have a run in with my father. Dad and Mom had 7 children within 10 years. Getting that many ready on a Sunday morning with that age range was quite the challenge. My parents way of handling this was to get as many older children ready to go with dad to the Lord’s Supper at 9:30 and then dad picked up mom and the rest for Sunday School. Our unmarried elder made it a point Sunday after Sunday to take my dad aside and mention to him that he really needed to get his WHOLE family to the Lord’s Supper as it was the most important meeting. Finally, my father had had enough and said, “We are trying our level best to get our family to church, but if you would like to offer to come over on a Sunday morning and help us get the children ready, by all means, we would appreciate the help.” The single elder never said another word about it to my dad. So, although a very excellent elder in some aspects, he didn’t have the experience of a wife and family to give him perspective on dealing with family issues. He also was concerned with modesty in the young women. Instead of letting an elder’s wife handle talking to the mother of a young woman who continually attended meeting with low cut tops, he approached the girl directly. There was quite the uproar as you can well imagine, and then another elder and his wife came in to smooth things over. We loved him dearly as an elder and friend and so very much appreciated the fact that he cared enough to address sensitive issues, but we also know that there are situations that are best handled by a married elder. The Bible seems so clear on this topic, that it’s a wonder how these women can distort it. So important to be grounded in God’s Word. I wish more older women would step up and teach the younger ones, like you do, Mrs. Lori. Maybe we younger women need to let them know that we are willing to listen too. Thank you. I do, too. I have had older women tell me that they are simply not teachers and feel uncomfortable teaching young women biblical womanhood. There are no qualifiers in Titus 2:3 except that the women be “older” women. God can use any willing vessel and the older women definitely need to step up to the plate and the younger women need to have soft, teachable hearts to what the older women have to say since they are the ones with the experience under their belts. “God can use any willing vessel.” So true! I am shocked at how much of the world we have embraced in our “modern Christian” thinking. I am truly flabbergasted at the number of “Christian” women who do not follow the Bible in this area. Keep speaking up, Lori, for there are few that actually do. I will, Gigi, as long as the Lord gives me a voice! It’s a dangerous thing to go against the clear teachings of scripture. You’re so right, Dianne. We must honor and obey His Word. I don’t see why a housewife would know more than this educated woman with multiple degrees and numerous awards. John Piper, John MacArthur, and all of the commentaries of old agree with me and not her, so I think I will stick with a housewife’s views who agree with these wise and knowledgeable men rather than a woman is who is in clear violation of the Word of God. Quite the contrary, ive met some very highly decorated people who were ignorant on many levels. And housewives that held more wisdom and knowledge in areas where the more ‘educated and awarded’ people had little or no clue. It is also not difficult to see it clearly laid out in Gods word, that women are not to be in leadership or teaching positions over men. It doesmt matter how highly knowledgeable you are, the devil still tries to decieve and attack you. Oh, this is so sad. And so disappointing. Why is it so hard to simply obey what the Bible clearly teaches? 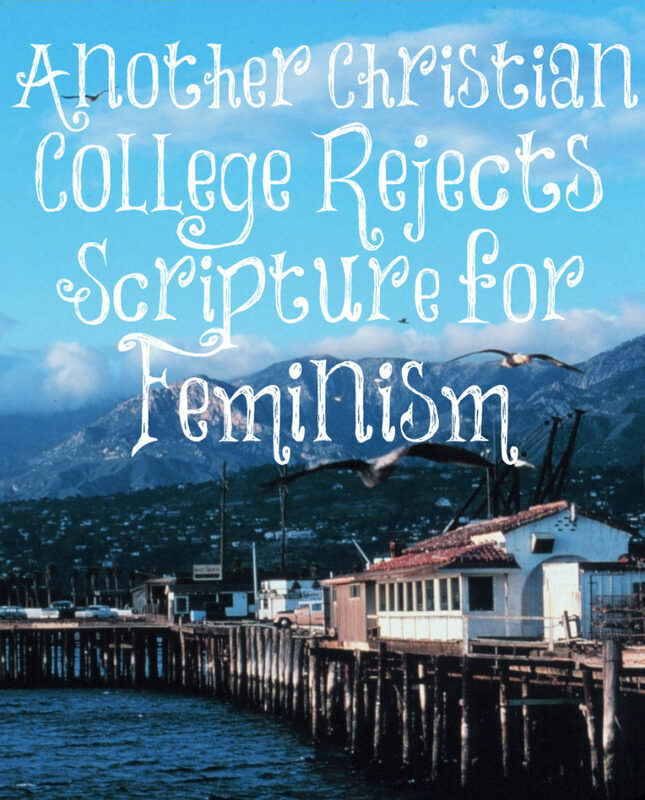 And shame on this college – they should be setting the example for biblical obedience, not flouting it and pandering to feminism.